It includes a thermoswitch module, which turns the fans on at approximately 82F. The thermal sensor's air-collection cup gathers hot air as it rises, to get an accurate measurement of the temperatures inside your component. Each fan unit has a specially-constructed raised air-chamber base that enlarges the area of air flow, while also sealing air and preventing vibrations. The air-chamber base covers twice the area of a standard fan. THE COOLING SYSTEM INCLUDES: 1 x dual-80mm (two fans) component fan unit, 1 x thermoswitch module, 1 x multi-speed power transformer, and printed installation instructions. All cooling system parts connect together using special heavy-duty Molex quick-connect plugs, which allows the parts to be separated for easy wire-routing. GUARANTEE: Your satisfaction is guaranteed. You can return the system for any reason within 30 days -- just contact me (through Amazon) and I will send you a prepaid shipping label. Since starting in 2005, AV Cabinet Cooling has sold over 10,000 cooling systems, and we are dedicated to great customer service. 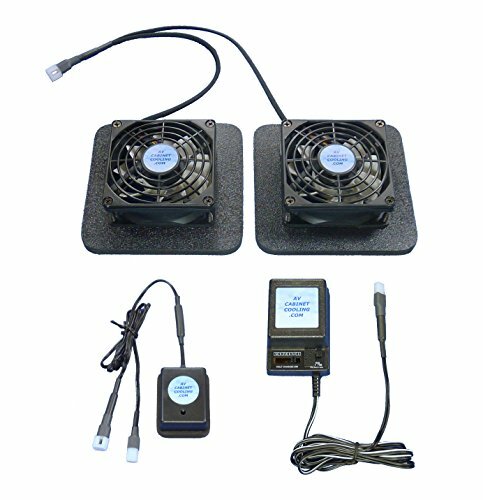 These two high-quality, super low noise 80mm fan units are designed sit on your component's top air vents. Each fan has a special raised air-chamber base, which covers nearly twice the area of a standard fan. A vortex of air is pulled out of the top of your component over the full area of these raised bases. The cooling system includes a thermoswitch module, which turns the fans on at approximately 82 degrees Fahrenheit. Just place the thermoswitch heat collector over a warm spot on top of your component's air vents, and it will do the rest. You control the speed of the fans, with the multi-speed power controller. Even at medium speeds settings, the fans will replace a volume of air equal to that of most components several times per minute. Recommended fan speeds for this system: The two fans (running together) are rated at 13db while moving 31 cubic feet of air per minute at 1/2 speed, or 16db & 41CFM at 2/3 speed. With component cooling, slow (and quiet) are the way to go! Other available speeds: 1/4 speed = 10db/16CFM, 3/4 speed = 19db/46CFM, full speed = 22db/62CFM. Each fan unit is 4-3/4" square, 1-1/2" tall (including the top grill and air-chamber base), and only requires 3/8" of space above the fans for air flow.